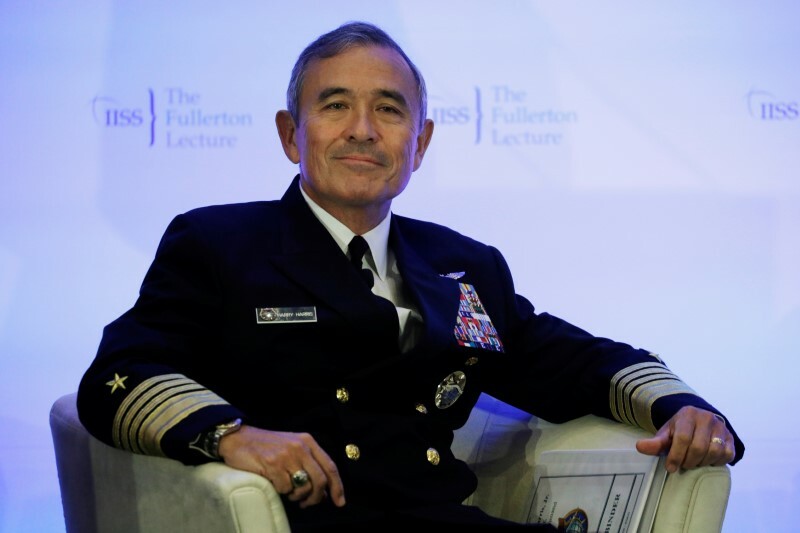 WASHINGTON (Reuters) – The Trump administration plans to nominate Admiral Harry Harris, the head of the U.S. Pacific Command already nominated to be the next U.S. ambassador to Australia, to fill the long-vacant post of ambassador to South Korea instead, U.S. officials said on Tuesday. President Donald Trump’s nominee to be secretary of state, Mike Pompeo, had asked Harris to take the key post in Seoul, which has been vacant since Trump took office in January last year, a source with knowledge of the situation said. Three U.S. officials confirmed the plan to nominate Harris, who was in Washington on Tuesday for a Senate committee hearing on his Australia nomination. That hearing was postponed indefinitely. The sources spoke on condition of anonymity. The White House did not immediately respond to a request for comment. Trump nominated Harris, who is known for hawkish views on China’s military expansion, to serve as ambassador to Australia in February, but filling the Seoul post has become even more of a priority as diplomatic efforts to resolve the crisis over North Korea’s nuclear weapons have intensified. South Korean President Moon Jae-in is due to meet North Korean leader Kim Jong Un on Thursday and Trump has said he will hold an unprecedented summit with Kim himself in May or June. “I will find what I believe to be the best fit to execute America’s diplomatic mission around the world,” he said. The White House said in February it was no longer considering Victor Cha, a former official who questioned the wisdom of a preventative military strike on North Korea being mulled by the administration earlier this year. He said he was encouraged by the prospect of a summit, but North Korea remained the biggest Asia-Pacific security threat. Harris said he believed Kim would like to see reunification of the Korean peninsula under his rule, and sought respect, status and security through the possession of nuclear weapons. Andrew Shearer, a former Australian national security adviser now at Washington’s Center for Strategic and International Studies think tank, said there would be “intense disappointment” in Australia – like South Korea, a U.S. ally – about the switch in nominations. “Harris is well known and highly respected there, and his nomination enjoyed strong bipartisan support. There’s no doubt he would have been a highly effective advocate at a time when there is growing debate in Australia about the U.S. alliance and its implications for the country’s substantial economic interests in China. Australia’s foreign minister, Julie Bishop, said Australia was not offended by the sudden withdrawal of Harris. “While we would have welcomed Admiral Harris as ambassador here in Australia, we understand there are significant challenges for the United States on the Korean peninsula,” Bishop told reporters after a service to commemorate ANZAC Day in Sydney. Australia has been without a U.S. ambassador for 18 months.